Dear Mica, in my opinion green and blue works absolutely well together and the outftis you show here are definitely the proof! How cool you had the first outfit in mind and simply put it on - the result is fantastic! 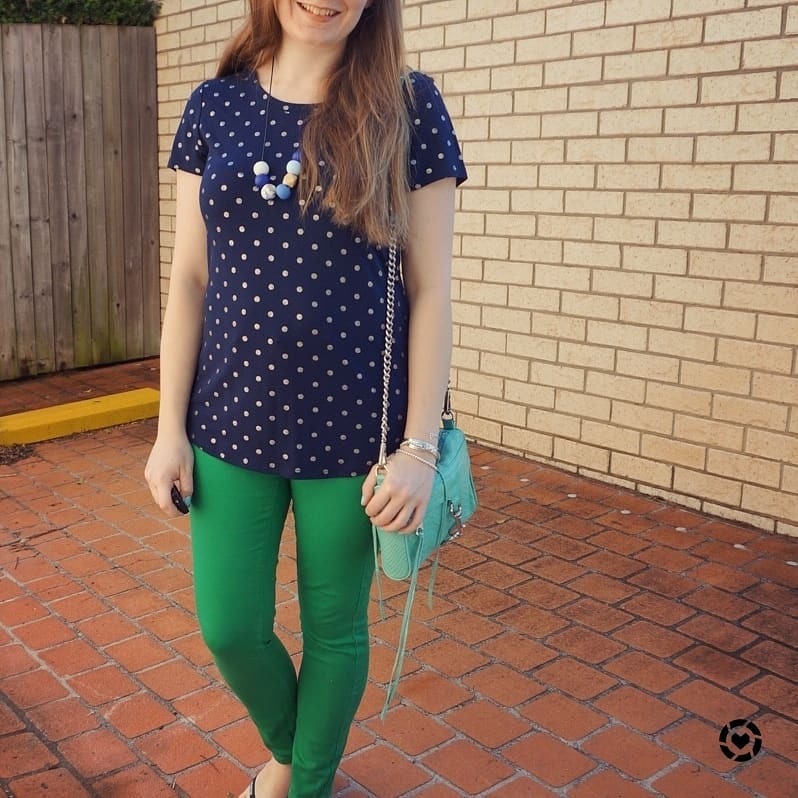 Navy and green really is a nice combo! I love navy blue and always want to wear more of it, but find it hard to pair since I mainly wear blue/black jeans. I need to try it with my olive jeans! 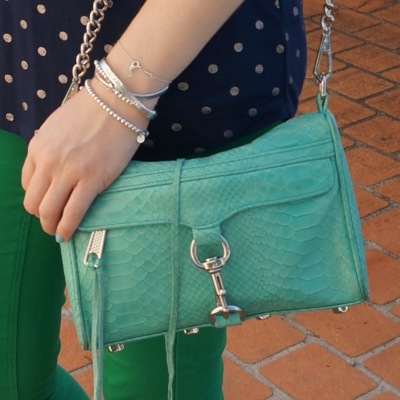 Also, I've had to give up caring about whether the hardware on my bag matches my jewelry of the day! I prefer if it does, but I can't stress if it doesn't. It was already enough effort to coordinate everything else in my outfit! Ha! Both of these outfit are great to run errands in. I'm so going to have to try out this color combo. I haven't had any alcoholic for the same reason. I'm actually affair to drink so now. Since I don't know how my body will recated to it. Thanks Shanaz! :) It took me a few goes to capture the photo so I'm glad you liked it! :) I'm growing my hair to donate it so I have a while before it will be long enough to cut! What a fun color combo! I love using green as a neutral. 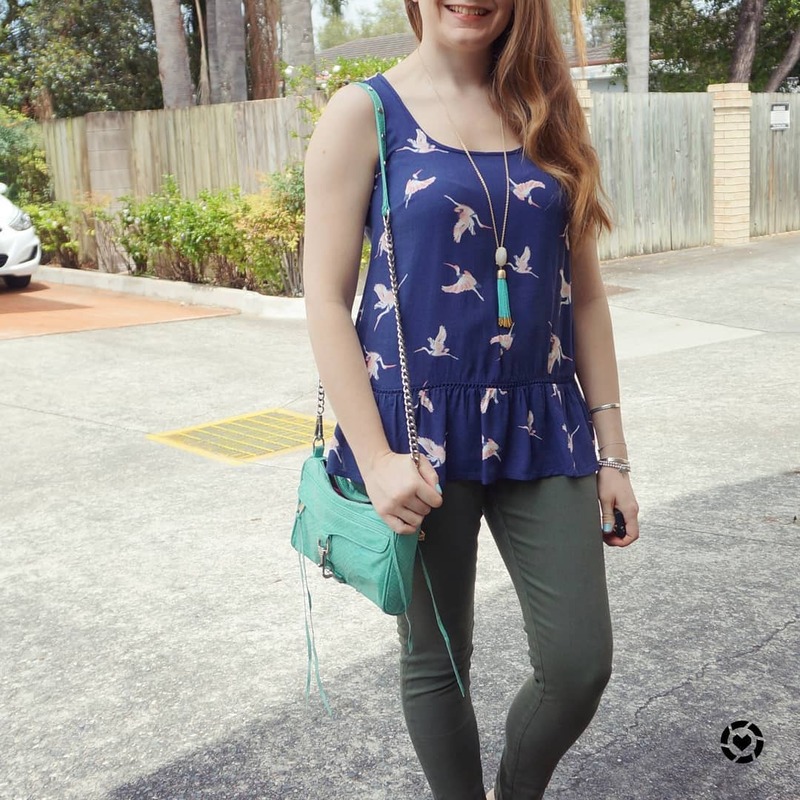 The printed top look so cute! I never paired green and navy together but I like the preppy feel it gives off. Cool giveaway too! I love the pops of green! Hope you're having a great week! Super cute outfits as always, Mica:) I love this colour combination, and in fact, the project I'm knitting for my Master Knitter course involves this two colours. It's such a classic! And love that RM bag of course! Mica, these are both super colour combinations! I love how you've tied the blue and green together with turquoise - that is brilliant. Happy week to you, my dear! The first necklace is really cute, and I agree, it goes perfectly with the rest of the outfit. Great combination! I hope you are fine because I just saw the weather report on the news over there. Thanks for your worry - I am fine, my family is fine. Our fireys have done such a good job, thankfully we have had some rain to break the heatwaves and stop the fires! Love both looks! I need to get a pair of olive pants. I adore the color. Love the first look! 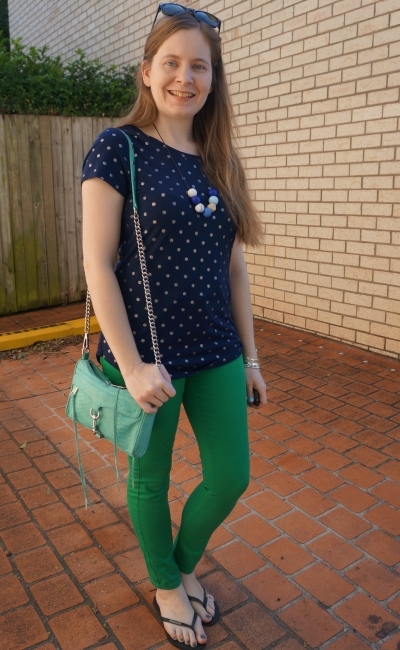 Navy and olive pair so well together and the addition of aqua is so pretty! I love both of these looks! Those green pants look great on you! You did such a great work mixing green and blue! Great color combination choice! I'm going to need to wear navy and green more since they look so good together. I love how the first pair of pants are more of a 'neutral' and the second pair are really bold. Hope you're having a wonderful week! I love the blue + green together! I just bought a pair of olive jeans and now I'm thinking of all the navy I could pair them with--I really like that combo! I should wear green and blue together more. I don't have the brighter green color in my closet like your pants in the 2nd photo, but I do have a lot of olives! That santa scarf is SO cute! I don't actually own much green in my wardrobe so this is not a color combination I wear much but it's a lovely one and easy to see why it's s go to for you. Good luck to everyone on the giveaway! Oh MIca, so many of my very favorite things. I love the combination of blues and greens together. I also love polkadots and bird prints. 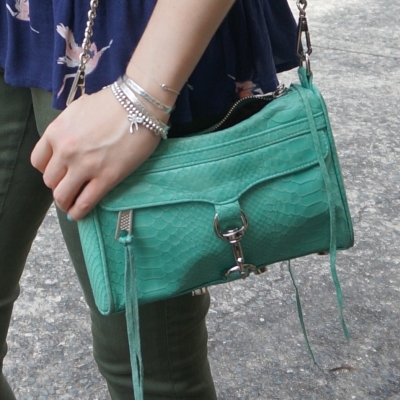 The reptile embossed detail on that beautiful Rebecca Minkoff bag is truly amazing. Great outfit! I don't wear a lot of green but I'm starting to get into more green eyeshadow. I'm a sucker for anything blue or anything paired with blue so these looks are right up my alley! The color combinations are beautiful! I especially love you tank in the first outfit! It's such a pretty print! I got cold few days ago and I am still trying to recover hope you are having a good day . Sorry to hear you've been unwell, hope you feel better soon! Green and blue really is a beautiful color combination. I love both of these comfy casual looks. Green jeans make such a fun base. You always rock those green pants, girl! And I love the fun bird pattern on that tank! Lovely casual outfit dear. Cute combos you have here, especially the 2nd one. Great blue and gree combo. go green...I love wearing green. Great outfits, you styled those green jeans so well. I love it! I'm a huge fan of green on other people, especially on you, I think it looks great! Wonderful giveaway too, Mica!